‘Skeptic Climate Scientists Do Not Deserve Fair Media Balance.’ Spread This Line Widely; NEVER Check its Veracity and Don’t Examine its History. 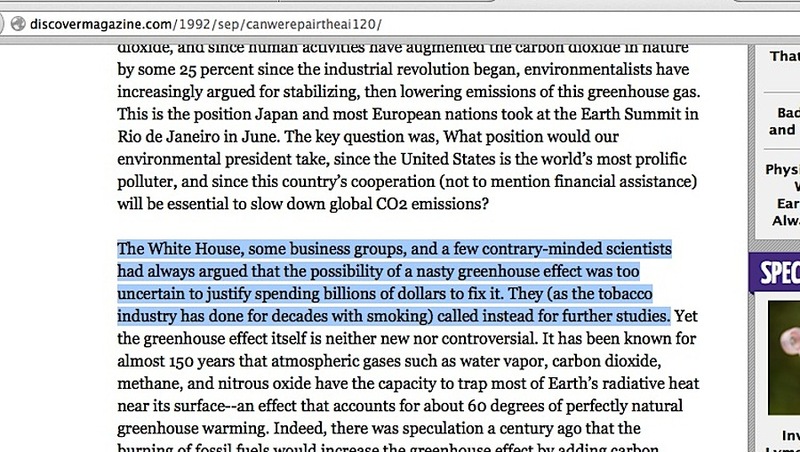 ‘When a topic is soundly settled, it is egregiously stupid to consider long-debunked counterclaims, and Ross Gelbspan was among the first to see the stupidity of anyone doing exactly that in discussions about global warming.’ This would be a devastating statement if either of the two premises within it were demonstratively true. So, why would anyone make such a statement if either premise cannot stand on its merits? …“It was only science writers that were covering this stuff and they were not the types to follow the money,” Gelbspan says. Climate change doubters in those years were taking a page from the fight against the regulation of tobacco products, urging newspapers and radio and television networks to provide “balance” in their reporting of the science. Gelbspan was among the first to understand the folly of their claims. But journalists of lesser mettle were easily fooled or simply too caught up in the quotidian pressures of meeting deadlines. In this way, the denialist community successfully drove a wedge between scientists and reporters. Five errors in a single passage. 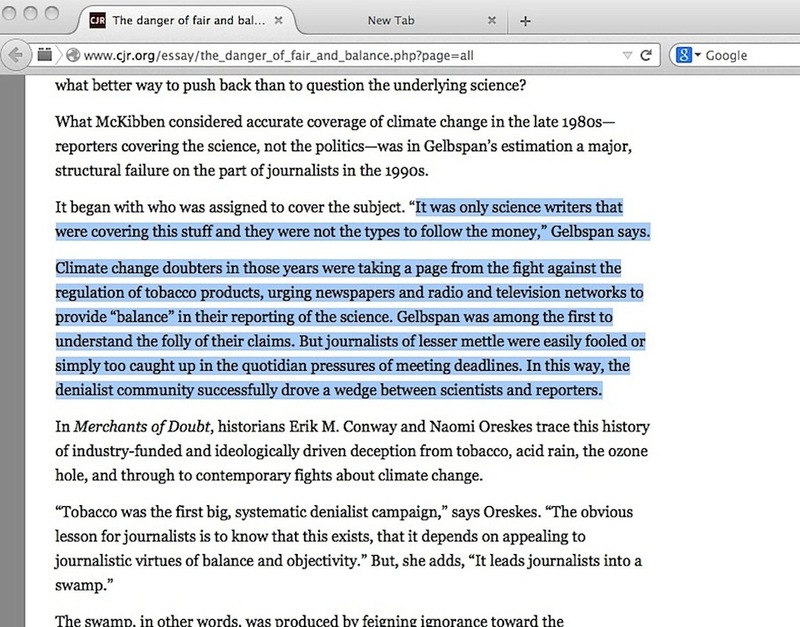 Neither Gelbspan nor anyone repeating his accusation ever proved the money trail led to an industry directive to lie about global warming science; none of them have proved skeptic climate scientists were instructed to mimic tobacco industry tactics; journalists have demonstrably not offered overall fair balance in to skeptic climate scientists; the ‘wedge’ being driven is one arguably pounded by enviro-activists who push the ‘skeptics don’t deserve fair media balance’ talking point; and Gelbspan was not the first one to bring up this talking point. 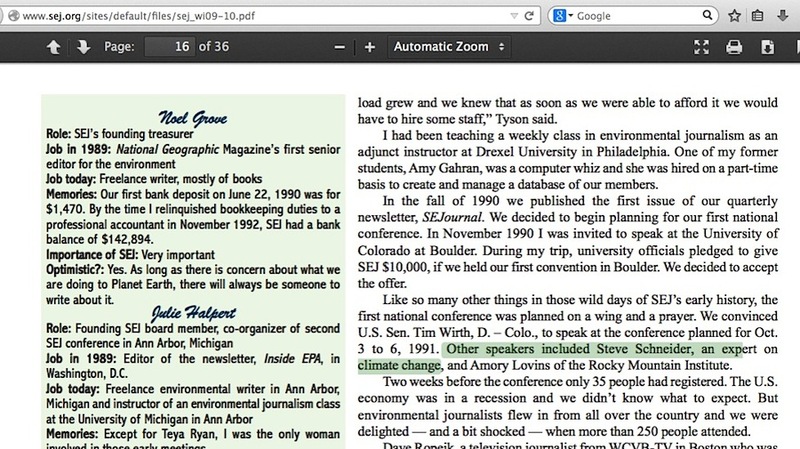 Yes, many people repeat Gelbspan’s line about reporters giving unfair media balance to crooked skeptic scientists, but it doesn’t take much additional digging to see where a Senior Producer at Turner Broadcasting, Teya Ryan, made her case in 1990 with a lengthy opinion in the Society of Environmental Journalists Winter 1990-91 newsletter about media balance being “artificial, a matter of giving equal air time or newshole space to dissenting views of questionable merit. Global warming is perhaps the issue that has been most muddied by this practice.” Read on a little further at that photo link, she speaks of ‘experts having doubtful motives’ and how balanced reporting just leaves the public confused. 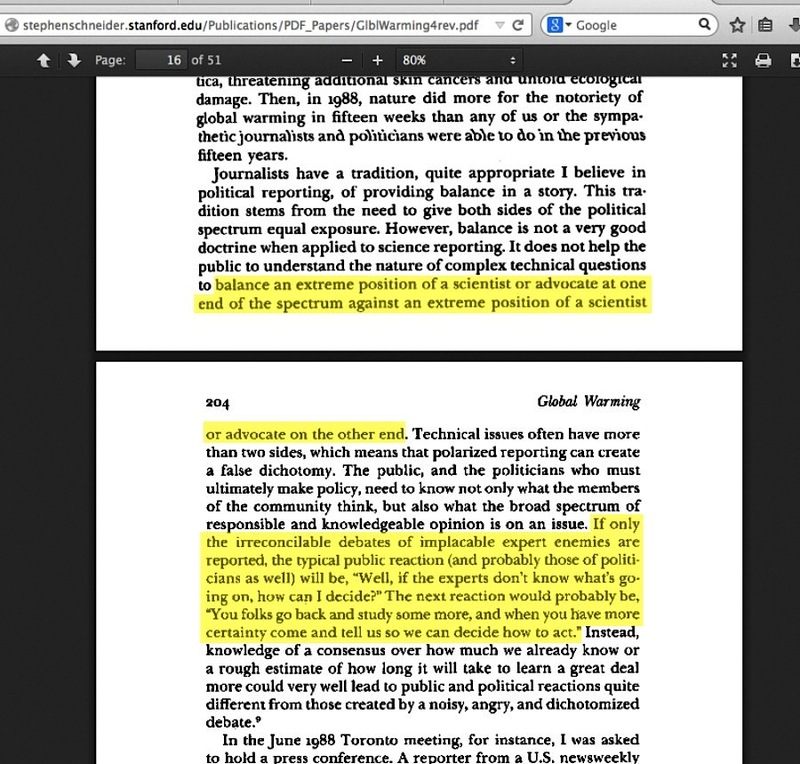 Her bit was 1½ years before Gelbspan even had a partial association with the idea. Journalists have a tradition, quite appropriate I believe in political reporting, of providing balance in a story. This tradition stems from the need to give both sides of the political spectrum equal exposure. However, balance is not a very good doctrine when applied to science reporting. It does not help the public to understand the nature of complex technical questions to balance an extreme position of a scientist or advocate at one end of the spectrum against an extreme position of a scientist or advocate on the other end. Technical issues often have more than two sides, which means that polarized reporting can create a false dichotomy. The public, and the politicians who must ultimately make policy, need to know not only what the members of the community think, but also what the broad spectrum of responsible and knowledgeable opinion is on an issue. If only the irreconcilable debates of implacable expert enemies are reported, the typical public reaction (and probably those of politicians as well) will be, Well, if the experts don’t know what’s going on, how can I decide?” The next reaction would probably be, “You folks go back and study some more, and when you have more certainty come and tell us so we can decide how to act.” Instead, knowledge of a consensus over how much we already know or a rough estimate of how long it will take to learn a greed deal more could very well lead to public and political reactions quite different from those created by a noisy, angry, and dichotomized debate. 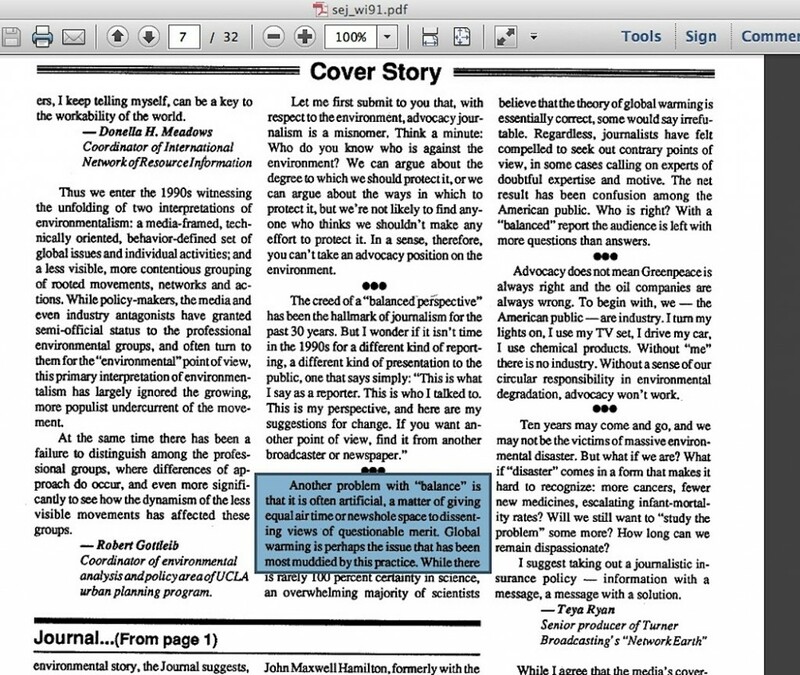 At the inception of the Al Gore era of the global warming issue, Stephen Schneider and the Society of Environmental Journalists spotted the very thing that could stop the issue in its tracks – if the public only saw scientists contradicting each other over whether man-caused global warming was a problem, the issue would never advance as a problem in need of a solution. If the public ever saw scientists who push the idea of man-caused global warming as fringe elements unable to support the merits of their argument against withering criticism, the issue would implode. And wouldn’t those talking points pack a fatal punch with reporters if you could say a Pulitzer winning investigative reporter discovered a leaked coal industry memo which was proof for skeptic climate scientists being paid to “reposition global warming as theory rather than fact.” As long as the reporters never found out this individual never won a Pulitzer, didn’t discover the memo, never proved it was a top-down industry directive and that he gleaned his “unfair media balance for skeptics” talking point from an IPCC scientist who earlier speculated whether the solutions to global cooling were worth the cost, then everything would be just fine. This entry was posted in Repeated talking points, Society of Environmental Journalists, Unfair Media Balance and tagged Stephen Schneider by Russell Cook. Bookmark the permalink.